No AntibioticsNo HormonesNo Animal By-ProductsIs Vegetarian FedNo MSG Like I said, I am okay with my boy eating this delicious bacon. On occasion we even end up with two packages in one week. 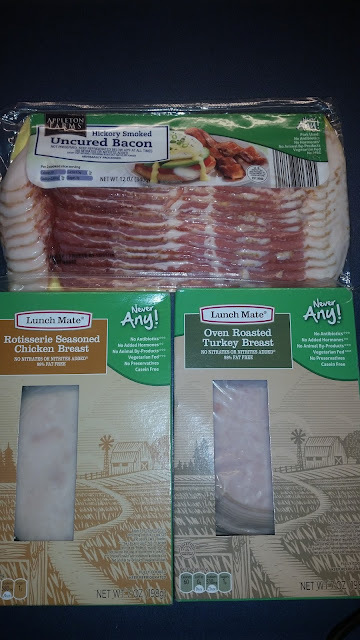 The Never Any lunchmeat is also a staple in my house. It's a favorite when we have toasted sub sandwiches for supper. Other Never Any products I have found at Aldi: Ground Pork Sausage and Chicken Sausage links. Yet another thing on my Aldi wish list showed up in stores! Cage Free Organic Large Brown Eggs - Thank you Aldi! This is why I LOVE Aldi! Below is the response that I received after inquiring about a few products. The reason I sent the email is because the clerk at my local store told me to email and let them know and sometimes they are able to send more. Talk about amazing customer service! Thank you for reaching out to us regarding our Easy Home Robotic Vacuum and the Specially Selected Indulgent Popcorn Tin. Our "Special Buy" program allows us to provide customers with unique items available for a limited time. With new Special Buy products coming in every week, we have to sell them quickly to make room for the next exciting offers. The item(s) in question was a Special Buy we carried in our stores while quantities lasted. Unfortunately, we are unable to get any more at this time. 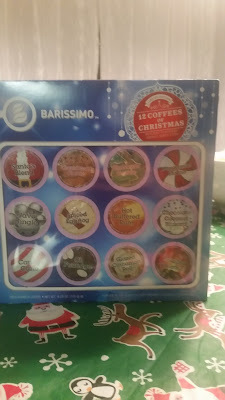 Barissmo 12 Coffees of Christmas For only $6.99 you can get your coffee lovers Christmas present at Aldi! I saw this in the ad a few weeks ago, but today I saw it while doing my weekly shopping and I couldn't resist. Reading the flavors made my mouth water: Santa's Blend, Gingerbread Cookie, Christmas Cookie, Peppermint Mocha, Java Jingle, Spiced Eggnog, Hot Buttered Rum, Chocolate Coconut Blizzard (my son asked if he could try this one), Candy Cane, Oh Fuuudge!, Glazed Cinnamon Roll, and Roasted Chestnut. I told my son we were getting this for Dad, but I'm thinking I may have to get into it this week! I'll keep you posted!